I was unlucky enough to have an allergic reaction yesterday. I have no idea what caused it. I ordered take away from the usual Indian restaurant and had the same dishes as usual. I realised something was wrong about five minutes after finishing my meal, which got me thinking……. 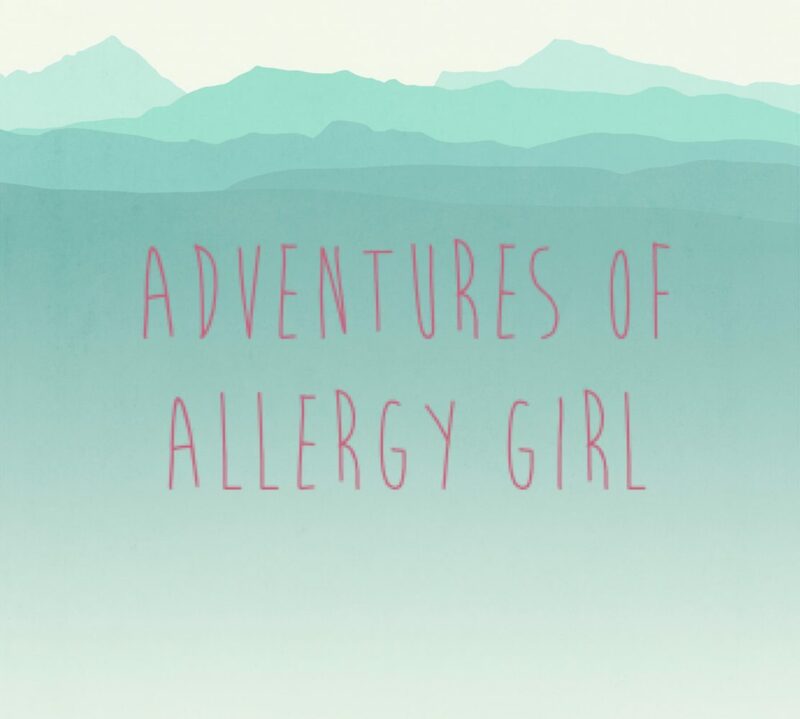 No two allergic reactions are ever the same, and they vary based on the severity of the allergy and the amount of allergen the person is exposed to. I guess they also vary from person to person as everybody’s allergy will be different. For example my brother, Allergy Boy, tends to have bad eczema after eating something he’s allergic to, whereas I tend to have a more anaphylactic style reaction (although once when he was a baby he touched a raw egg and swelled up like a red ballon. Not good). Dust and pollen allergies usually affect the eyes and nose, and anyone that has suffered from hay fever will recognise the symptoms. Asthmatics may also get wheezy with these allergens, and may need to use their ventolin (blue) inhaler. Allergies to animal fur and feathers can present themselves in a similar way to dust and pollen allergies, but they can also cause anaphylaxis. One of the most serious reactions I ever had was to dog fur one Halloween. I was at a house party when someone knocked a bowl of crisps onto the rug, where a very hairy dog had been sitting. I helped clean up, and almost immediately my throat started swelling, my nose began to run and I couldn’t breathe properly. My friends (still dressed in their Halloween costumes) took me to A&E where I was put on a trolley in the corridor and left there for four hours. By the time I finally saw somebody, most of the symptoms had died down. I think I finally got home at about 6am, and slept for the rest of the day. Lumps under the skin, starting at the hairline and gradually spreading around my head. Sometimes I’ll also get these on my arms, back, stomach and chest. Swollen face and eyes on very severe occasions. Last night I had everything apart from the swollen face, although I did have lumps under my nose, which was fairly unpleasant. When I have an allergic reaction I generally use cetirizine hydrochloride to treat it. I don’t know how many tablets should be taken as a recommended dose, but I ended up taking four yesterday. In addition I have Fexofenadine, a daily antihistamine, which can be taken at the same time as the cetirizine hydrochloride. I also carry an Epipen for very severe reactions. Luckily I’ve never had to take my Epipen, as usually the combination of antihistamines does the trick (which is good news, as all four of the Epipens I found in my handbags were out of date!). Apparently I should have taken the Epipen the night I ended up at A&E, but I was only told this when I finally got to see a doctor. In addition to medication, drinking lots of water can help flush it through. Sucking on ice lollies or ice cream can also help to soothe the soreness of the throat and reduce the swelling. The day after an allergic reaction I often feel extremely wiped out. The allergic reaction attacks the body, so I sometimes have flu like aches and shivers and am drowsy from the antihistamine. If my throat has swollen during the reaction I will have a sore throat that sometimes lasts a couple of days. Allergic reactions aren’t always visible to other people, so if someone tells you they’re having an allergic reaction, ask them what medication they have in their bag, find it for them if they need to you to and get them a glass of water. If they are having trouble breathing and they have an Epipen, use it. The instructions will be on the packaging, but it should be noted that once an Epipen has been administered to a person they should attend A&E. Allergic reactions can be deadly and can come on very quickly, so the most important thing is to act quickly and keep calm. So, that’s what happens when I have a reaction, hopefully this might be of some use, but fingers crossed you’re never in the situation where you’re either having a reaction or with somebody that is. Did you know – supermarket or chemist own brand/budget antihistamines are the same as the branded tablets and often half the price!